We've pushed the limits on how much you can get an immersion blender (hand blender) to do, and after testing the top 10 currently available, we're confident in putting forth the Cuisinart CSB-75 Smart Stick as our top pick. It's power, versatility and durability for the wildly low price make it hard to go past. Even with all the fancy schmancy, high end, high tech blenders on the market today, the humble immersion blender is still a kitchen staple for smart home cooks. They’re cheap, they’re powerful (increasingly so in recent years), they take little cleanup and little preparation and if you get the right one, they’re good for blending an incredible number of things. But that last part is the big question: Which is the right one? There are different price points, feature sets, and warranties and there’s no point spending the money if it’s not going to do exactly what you want. Our “Top 5” list compared the best models across all the important categories, and decided on a ranking we’re pretty confident in. It should help you decide which option is best for your personal needs, for right now in 2018. Here’s the criteria we used, followed by this definitive list. 1 How Do We Rate Immersion Blenders? How Do We Rate Immersion Blenders? When it comes to determining which is the immersion blender on the market in 2018, how do we go about it? In measuring the immersion blender we use a set of five criteria. First on our list – now for the 2nd year running – is the CSB-75 Smart Stick by Cuisinart. Given what most people are looking for in an immersion blender, this model is the perfect balance between affordability and performance. In fact, you can usually find the CSB-75 Smart Stick for around $30, which makes it $70 cheaper than the most expensive blender on our list, the #5 Breville BSB510XL. But just because it doesn’t cost $100 doesn’t mean it won’t do everything you want a handheld blender to do. It comes with a 200-watt motor, which is the standard for the blenders on our list, except for the #5 Breville. But this is more than enough to do all the mixing you want. In addition, the CSB-75 comes with two speed settings, whereas the #3 KitchenAid model comes with five different speeds. For most people, though, a low and high speed setting is more than enough for mixing drinks, pureeing, whipping batter, or whatever blending tasks you have in store. The CSB-75 features a detachable shaft which can be removed by simply pushing it up and twisting; no tools are required. The shaft is then fully dishwasher-safe to make the cleanup a breeze. You operate the blender with a one-touch button that is ergonomically placed on the grip for easy activation. The end of the shaft features a stainless steel blade for efficient mixing. It also comes with a slotted guard which both protects you from being cut and maximizes the mixing flow while the blades are spinning. Cuisinart has not supplied the CSB-75 with many accessories; it is more or less just a straightforward blender. However, they do include a two-cup mixing bowl that is large enough for the shaft. Other models, like the #4 KitchenAid, will come with multiple attachments and other mixing accessories, but a single mixing bowl is a nice addition when all you really want is an immersion blender. However, while it may not come with many accessories, it does come in a variety of colors – seven, in fact! From red to white to blue, no other model on our list gives you as many options when it comes to the look of the blender itself. Cuisinart has also supplied the CSB-75 with the longest warranty of any blender on our list. With a three-year limited liability warranty, no other model comes close to offering this kind of guarantee. So, for both price and performance, the Cuisinart CSB-75 is one of the top immersion blenders on the market. If you are looking for a straightforward, dependable, no-frills blender, the CSB-75 is one of the best options available. Hamilton Beach is a well-known name in the kitchen appliance/blending world. This immersion blender has shown impressive results when mixing shakes, creams, soups, and drinks. With a price tag around $30, it costs about the same as the #1 Cuisinart model on our list. The differences between these two models come down to accessories and design. 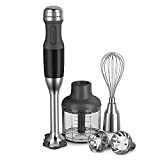 First, we should point out that, like most of the other models on our list, this Hamilton Beach hand blender comes with a 200-watt motor which drives a detachable shaft. The shaft itself is designed for maximum mixing and flow when in operation. While the Cuisinart CSB-75 has a stainless steel shaft, the Hamilton Beach Turbo-Twister shaft is primarily a plastic housing. So it is not quite as durable as the Cuisinart model. Second, the #1 Cuisinart CSB-75 has a better-designed grip and activation button than the Turbo-Twister. While both come in two speeds, the Hamilton Beach model is turned on by a button that is somewhat awkwardly located so that the thumb, rather than a finger turns the blender on. This design difference makes it somewhat more difficult to learn to use the blender. This is why, for sheer ease of use, the Cuisinart beat out the Hamilton Beach model for our #1 spot. Third, however, Hamilton Beach does offer an accessory that the Cuisinart lacks: an attachable whisk. With both a whisk and a blending wand attachment, you will be able to perform a wider range of tasks. If you are planning on doing a lot of whipping, the power whisk is a definite bonus over the #1 Cuisinart’s wand only. The whisk is stainless steel and dishwasher-safe for easy cleaning. Like most of the other models on our list, the Turbo-Twister only comes with a one-year limited warranty. This covers any manufacturing errors or parts defects that may occur after the time of purchase. And, unlike the #1 Cuisinart which comes in seven colors, the #2 Hamilton Beach only comes in white. So, if you’re looking for an immersion blender for a reasonable price that also comes with a whisk attachment, the Hamilton Beach Turbo-Twist is a great option! If you’re ready to move beyond the basics of hand blenders and take things to the next level, then the #3 KitchenAid might be what you’re looking for. While the #1 Cuisinart and #2 Hamilton Beach blenders each cost around $30, you can expect to pay closer to $90 for the KitchenAid KHB2561. That’s quite the jump in price, but with the added cost come some impressive features. Let’s start by looking at how the KitchenAid is similar to our previous two models. With a 200-watt motor, the #3 KitchenAid has the same power as all other models on our list, except the #5 Breville, which has a 280-watt motor. The difference between 80 watts will not be noticed with regards to performance, so you can be sure that this hand blender is strong enough to handle anything the other models can. However, while both previous models came in two speeds, the KitchenAid hand blender gives you more control over your blending by giving you five different speed settings. Having five speeds is an excellent variable control option between the two-speed setting of the Cuisinart models and the #5 Breville blender, which comes with 15 different speeds. Such specificity of control is unlikely to be necessary for anyone but a professional chef, so the five-speed control of the KitchenAid will give you all the range you need to blend different kinds of foods with different consistencies. The KitchenAid also only comes with a one-year warranty, like the #2 Hamilton Beach and #5 Breville model, whereas both Cuisinart models on our list come with a three-year warranty. However, one year is fairly standard in the industry so this isn’t exactly a “con,” but if the warranty is a big concern for you, either Cuisinart model on our list has longer terms. Besides the different speed settings, the other major difference between the #3 KitchenAid and other blenders on our list is the number of accessories that KitchenAid has packed into this model. To begin with, it comes with three different bell blade attachments (while both the #1 Cuisinart and #2 Hamilton Beach only come with one). These attachments allow you to do specialized and controlled tasks like frothing milk, crushing ice, pureeing soup, and just about anything else you might do with a blender. In addition to these three interchangeable blades, the KitchenAid also comes with a stainless steel whisk attachment. This attachment is perfect for those wanting to whip eggs, creams, or vinaigrettes. The attachment is listed as “top-shelf” dishwasher safe, so cleaning it is not a problem. Another accessory that is offered by KitchenAid is a “chopper attachment.” This is a 2 ½-cup container with internal blades at the bottom and an adapted lid. The lid itself is attached to the shaft of the hand blender which then rotates the lower blades through a central shaft. This is perfect for, as the name suggests, chopping up all kinds of foods, from cheese to nuts to herbs. Both the #4 Cuisinart and #5 Breville come with a similar accessory, but these are lacking in the #1 Cuisinart and #2 Hamilton Beach models. If you want to do more than just blending and whipping, then these chopping cup attachments are a great bonus. The KitchenAid also comes with a four-cup pitcher, which can be used to store your sauces, shakes, or purees. The tight, sealed lid will help keep your food fresh. Only the #5 Breville model comes with a comparable pitcher, though both Cuisinart models on our list come with small cups. This pitcher offered by KitchenAid (as well as the chopper attachment) is BPA-free and a great way to mix your foods in a safe and durable container. This way you do not have to worry about damaging your own cookware. Speaking of keeping your cookware and dishes safe, another great feature that KitchenAid has included in this package is a customized rubber pan guard that attaches to the bell blade. The #5 Breville model has a similar, though not removable, feature, but the other models on our list lack this protection. With this rubber guard, you will be able to use the KitchenAid even in a deep pot and not have to worry about the stainless steel bell blade scratching your pots and pans. And as if all this wasn’t enough, KitchenAid has also included a storage case where you can keep all of these accessories in one convenient location. No other model on our list comes with this kind of storage feature. Of course, the chopper attachment and the pitcher will not fit in the case, but everything else, including the blender itself, can be safely stored away for many years of use. If you are looking for something that is more than just an immersion blender and that will give you more options than just mixing drinks and soups, then the KitchenAid KHB25610 is a great choice. With this one appliance, you can cut down on hours of prep work and maintain quality through one precise tool. For our #4 top immersion blender, we return to a Cuisinart model. The Cuisinart CSB-79 is part of the same series of blenders as the #1 Cuisinart CSB-75 on our list. The two models come with many of the same features, but the CSB-79 runs closer to $50 while the CSB-75 is around $30. Cuisinart calls this series the “Smart Stick” because, well, everything is a “smart” something or other these days. But in reality, there is technically nothing “smart” about this immersion blender (that is, there are no sensors or other high-tech components to make it any different than the other models on our list). Both these Cuisinart models come with a two-speed, 400-watt motor that drives the detachable blade assembly. Customers consistently report on the use of use and high performance of these hand blenders, which is one reason why the CSB-75 was #1 on our list. And the CSB-79 has all those same high ratings. The main difference, and the reason for the higher cost, between these two models are the attachments included with the CSB-79. While the #1 CSB-75 comes with no attachments, the #4 CSB-79 comes with both a whisk attachment and a chopper attachment. With these two attachments, your handheld blender has a wider range of functionality and you have more options for cooking preparation. The chopper attachment included in the #4 Cuisinart CSB-79 works just like the attachment of the #3 KitchenAid. The container has blades at the bottom and the top attached directly to the wand which chops your cooked meat, vegetables, spices, etc. And with the whisk attachment, you can whip creams, froth milk, etc. These attachments are great for when you want to do more than is possible with just the wand and blade. Like the CSB-75, Cuisinart also includes a three-year warranty with the CSB-79. That’s two years longer than any other model on our list. This is a good sign that Cuisinart stands behind their product and knows it will last. One last difference between these two Cuisinart models is the color options. While the #1 CSB-75 came in seven different colors, the #4 CSB-79 only comes in two choices: stainless steel and red. If you like the CSB-75 but would really like the flexibility of more attachments and don’t mind paying a few more dollars, the Cuisinart CSB-79 is a quality immersion blender that is easy to use and maintain. #5 on our list is the BSB510XL Control Grip Immersion Blender from Breville. It is the most expensive handheld blender on our list since its average price is right around $100. The closest to this is the #4 KitchenAid, which comes in around $90, but with prices always changing, you can possibly find either of these for a little less. Breville is known for its luxurious designs for home appliances, and this blender is no different. The BSB510XL has the most powerful motor on the list, coming in at 280 watts, while all other blenders have only 200 watts. However, it is unlikely you could ever actually tell the difference. There is really no measurable advantage to an additional 80 watts. One disadvantage to the Breville is that, with the higher price, you would expect it to come with more accessories. For example, the #3 KitchenAid comes with six different attachable accessories, but the Breville only comes with one. The attachment that Breville includes is a chopping bowl much like the #4 Cuisinart CSB-79. Also, like the KitchenAid, this Breville model comes with a large pitcher which can be used to safely mix and store your foods. Another major difference between the Breville blender and others on the list is that the Breville comes with more precision of operation. Using the controls on the grip you can choose between 15 different speeds; the closest competitor to this on our list is the #5 KitchenAid, which comes with only five speeds. This allows you to find the perfect speed for a whole host of different applications. No other model of the top 5 can perform with such exactitude. As we’ve mentioned before, the Breville only comes with a one-year warranty, which means both Cuisinart models on our list have longer warranty terms. However, Breville has an excellent reputation for high satisfaction in customer care and service. There should be no doubt that they stand behind their product. If you’re looking for a powerful immersion blender with excellent speed control, this Breville model is one of the best on the market. So, if you’re looking for the best basic immersion blender with no frills that is dependable and gets the job done, the #1 Cuisinart CSB-75 is a great option at an affordable price. If you like the Cuisinart but also want the option of an attachable whisk, then the #2 Hamilton Beach will perform nearly as well at about the same cost. Or, if you like the #1 Cuisinart but would like the chopping bowl accessory, then the #4 Cuisinart CSB-79 would do the trick. When you’re ready to make an investment and spend a little money, then the #3 KitchenAid comes with more bells and whistles than any other model on the list. It’s also nearly the most expensive, but we think that’s worth it for all the added benefits of the accessories. If you want the highest-quality parts and the most durability of the models, then the #5 Breville is probably the best option. It will cost about as must as the KitchenAid and doesn’t come with as many accessories, but it has a greater speed control for precise blending. With these five immersion blenders, you’re sure to find a handy kitchen tool to make your life easier. This article was exactly what I was looking for! Thanks!!! Thank you for this very detailed report, it truly helped with my decision. Great article and I loved the pro and con comparisons. I now know which blender to buy. Excellent Review. Helpful information. Thank you. Brilliant review and concise! Thank you for taking the time to do this.